Nokia might not be the most popular smartphone manufacturer any more, but it seems its Ovi Store is the place to be for budding developers. 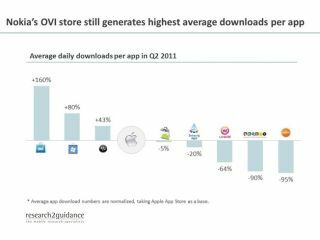 According to mobile analytics specialists research2guidance, which rated the amount of times a single app was downloaded on average, a single app on Nokia's Ovi Store will be downloaded 160% more often than an app on Apple's App Store. Of course, this should be put in context: there are nearly ten times more applications on Apple's platform than Nokia's, but it seems that lack of competition combined with a thirst for apps from users means developers will get a higher download ratio on their efforts from the Finnish firm. The numbers show that smaller app stores on mainstreams platforms are the place to be, with Microsoft's Windows Phone Marketplace and RIM's BlackBerry World offering 80% and 43% higher download rates respectively – again, fewer overall downloads, but a higher selection average than Apple. Google's Android Market put in a strong showing with only 5% fewer downloads per app than Apple, but Samsung's app platform was 20% worse off… and the less said about webOS' –95% the better. So it seems Apple might have all the big numbers, but in terms of managing to fight through the noise as an independent developer, you might be better off on one of the less-hyped platforms.